Visit a Costa Rica coffee plantation! Spanning over 200 years, the coffee industry has been a vital force in the Costa Rica’s rich history and the development of Costa Rican culture and society. Coffee has been a major cornerstone of the nation’s economy. Because of its importance to Costa Rica’s economy, it is locally referred to as The Golden Bean. Coffee in Costa Rica is some of the best in the world. But why is the coffee in Costa Rica so excellent? The coffee beans grow in nutrient-rich volcanic soil and coffee plantations are cultivated on varying altitudes. There are eight local regions for coffee production in Costa Rica, and each region is committed to the responsible treatment of the natural environment. Visiting a local coffee plantation is a fun, enjoyable and culturally significant activity in Costa Rica. Coffee farmers will be all too happy to share their pride and passion for coffee growing and will even let you have a taste of their product. Since the First Bean Coffee has been Important! The first coffee beans arrived in the New World from Africa around 1700s. Late in that decade, Costa Rica began to try to produce more profitable crops, and what they found was that coffee grew very successfully and was very profitable. By 1820, Costa Rica was the first country in Central America to be able to establish a flourishing coffee industry. Its first export of coffee went to Panama and then to Europe via Chile. Because coffee was so prosperous, a printing press began, and coffee seeds were distributed to landowners for planting to boost production. When the mid-1800s came around coffee production was flourishing and was being transported throughout the country on ox carts. The story of how the coffee industry got started is entangled with the story of the Spanish conquistadors. They named Costa Rica (Rich Coast) thus in the hope of finding valuable rocks and minerals in the hills. Since no such riches were to be found, they focused their attention on agricultural pursuits. Out of all the growing regions, the Central Valley region has proven to be the most profitable for coffee growing and coffee farms were cultivated in its hills. Other coffee growing regions include Santa Elena in the Monteverde Cloud Forest. When visiting this iconic National Park, many local establishments will offer coffee roasted from this local produce. Countries in the rest of the world liked the coffee from Costa Rica, and the demand rose. Then they began to export coffee to the United States, a much faster trade route then to Europe. As the demand increased for more coffee, it also increased for better infrastructure. Because of coffee Costa Rica’s infrastructure expanding significantly in the late 1800s to the mid-1900s. The railway to the Atlantic Coast was built, then a railway to the Pacific Coast and banks began to emerge as did post offices. Costa Rica then applied taxes to coffee that was active in encouraging exportation. The lead exportation during the 1900’s was coffee. Modern day Costa Rica still sees a significant exportation of coffee and the increased awareness of sustainable coffee production. The government mandates the coffee industry to a certain degree. 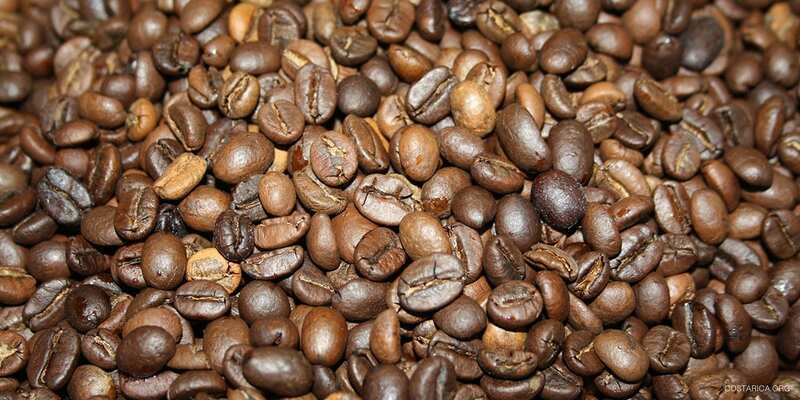 The coffee produced in Costa Rica is known as Arabica coffee. The Arabica beans have a deep and sweet flavor when brewed. The roast is often mixed with other ingredients and flavors such as chocolate, citrus or even berries, which creates an even more intoxicating blend. The dark roast generally has a pretty low acidity level in favor of a fuller and more complex flavor. But of course, the variety in the production process, the plant and of course the coffee growing regions, can produce different kinds of flavors. The strictly hard bean, for example, is grown above 39,000 feet. Coffee producers then hand select the beans by dividing the harder beans from the softer ones. In Orosi, the crop is grown underneath the shade trees with the intention of improving the quality. The awareness about our carbon footprint and greenhouse gas emissions has been growing and Costa Rica Coffee has become a world leader in sustainability and approaching agricultural endeavors in an environmentally friendly manner. This includes the production of green coffee beans. Maintaining a sustainable process has become almost as important as the quality of the roast. Costa Rica now tries to grow in harmony with the environment and to go along with how green Costa Rica is. Costa Rican law has a set standard for coffee mills for the highest quality coffee. These regulations are in place to help protect the environment including water, forests, and wildlife. The Ministry of Health and the Ministry of Environment in Costa Rica regulate the law concerning the coffee production. Coffee in Costa Rica is an excellent way to help improve Costa Rica’s socio-economic and a way to increase sustainable practices.